It was a Monday. Allison’s caterpillars were very large and fat now. We’ve had them for about a week and they have grown so much. We noticed that instead of just wandering around the bottom of the cup where the food is, they are starting to make their way to the top of the cup. At the underside of the top, there is a tissue paper type of cover where they will eventually make their chrysalis. They are on their way! This is the third time we have been scheduled for Mom’s surgery. Last Thursday, the day after her pre-op tests, we made the long trek back to the hospital for her 8:30 a.m. surgery. She had showered with a special soap they gave us in pre-op. She had fasted all night. When we arrived, she was very quiet. “How are you feeling Mom?” I had inquired. “I will have the nurse come talk to you,” she replied. Her nurse asked us to wait before getting her dressed. Then the head surgical nurse came in. Mom’s heart monitor showed a new development today. While waiting all this time for the surgery, her heart was now experiencing some new symptoms. I can’t remember all the medical jargon, but the result was that she was now in more serious risk and she was not going home, she would be checked into the hospital cardiac unit until her surgery could be rescheduled. So here we sit on Monday. They took her for surgery this morning, from her hospital room. We have seen her diminish in just the two days she has returned to the hospital. This morning, my siblings and I once again gathered to see Mom off to surgery. This time, instead of a lounge, we were in her hospital room. The nurse came in and talked to mom, and said that the transport team taking her to surgery would be here shortly. It was tense in the air as we waited for transport. And this time, Mom broke the silence. And so we did. 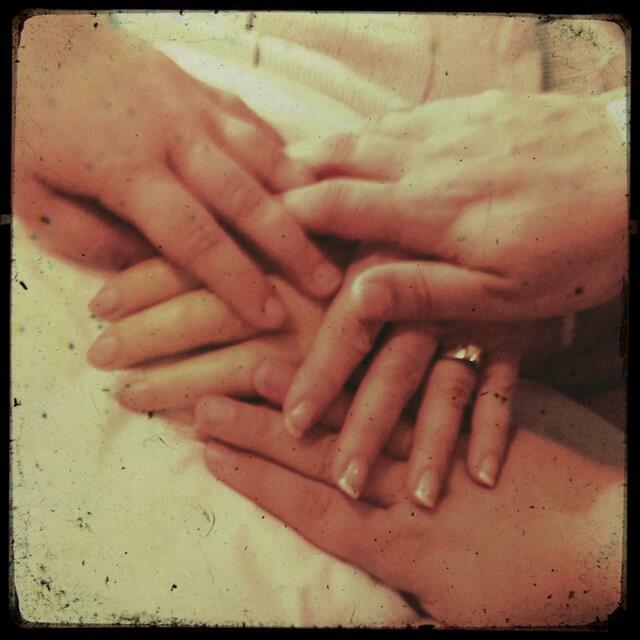 Once again, we encircled Mom, this time she joined hands in our circle. This time she requested the prayers. And we prayed for God’s will. As we finished praying, we realized the transport team had arrived, and noticing our family in prayer, was respectfully waiting right outside the door. They whisked in and we gave Mom last kisses before the surgery. Then like Allison’s caterpillars, she was on her way! Thank you Jean. Will be waiting for the rest. Love and hugs to you.